Posted on Apr 10th 2010 by Elisabeth Kvernen. Last month I had the great privilege of visiting Istanbul for a week. This post is the first in a series about the calligraphy organizations and resources I discovered on my trip. The purpose of my trip was to learn more about Arabic and Ottoman calligraphy, since Istanbul is the center for this art form. The timing of my visit coincided with that of my mentor Elinor Aishah Holland; together we spent time with fellow calligraphers, visiting museums and organizations with links to calligraphy (or hat, as it’s called in Turkish), and practicing calligraphy. One of the most wonderful things about Istanbul is that there is calligraphy everywhere you turn. Mosques, municipal buildings, homes, water fountains—you name it, there’s calligraphy on it. And many of these works were created by Ottoman master calligraphers, so it’s good calligraphy. In this first post, I’m going to share photos of some of the calligraphy I encountered while walking around the city and visiting mosques and museums. Posted on Oct 4th 2009 by Elisabeth Kvernen. I went to a craft festival in DC this weekend, and came across a lovely shop featuring Arabic writing on a variety of products. The shop was called Moth Written, and is the result of a collaboration of two artists—one from Maine and one from Morocco. While the Arabic writing on their products isn’t calligraphy per se, it is a great example of how the Arabic language is become (slightly) more mainstream in American culture. The booth generated a lot of interest at the craft fair, and the “I love DC” (in Arabic) buttons and bags were especially popular. Visit the Moth Written website for more information about the artists. Posted on May 6th 2009 by Elisabeth Kvernen. The calligraphy pieces below were seen in a shop near the Grand Mosque in Xi’an, China. They are written in the Arabic script, but reflect a distinctly Chinese aesthetic (particularly the two on the left). Posted on Apr 3rd 2009 by Elisabeth Kvernen. Water fountains like this with calligraphic inscriptions can be found throughout the city of Damascus. Posted on Mar 16th 2009 by Elisabeth Kvernen. 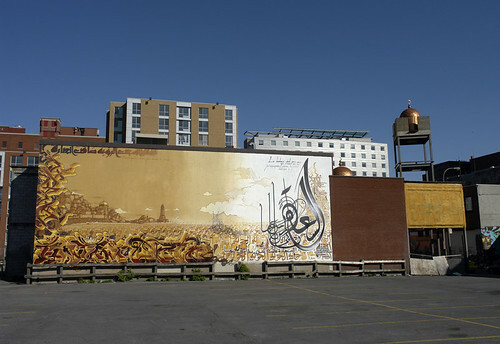 Mural in downtown Montreal, originally uploaded by mithraphoto.